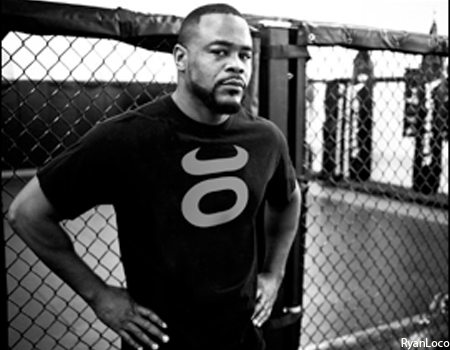 Having once donned the UFC light heavyweight title belt, Rashad Evans (Pictured) has been there and done that. Evans claims Phil Davis, the undefeated fighter he faces this Saturday, is just simply happy to be here. “Davis is intimidated,” Evans flatly stated during Wednesday’s media workouts. “I’ve seen him around and he’s not looking too confident. He’s not ready for this level and he knows it. He’s coming to put up a good show, go back down a level, and come back again in a year or two. Despite owning an unblemished 9-0 professional résumé, Evans isn’t exactly blown away with what Davis has accomplished during his brief three-year career. He professes “Mr. Wonderful” is no longer swimming in the shallow end and will drown come showtime. “Phil is just a nice guy. He’s not a fighter,” Evans assessed. “He’s an athlete, a great athlete, but not a fighter. He has no killer instinct for this and he’s got no experience at this level. He didn’t get punched by Chuck Liddell and Rampage Jackson like I did. He’s not had to dig deep at all. The 205-pounders headline the UFC’s return to primetime television this Saturday on FOX.